More Than Gourmet Veggie-Stock Gold/ Classic Vegetable Stock - A classic vegetable stock reduced 20 times to a glace. A wonderful addition to soups & sauces, rice & grain dishes, Veggie Stock Gold offers a classic addition to vegetarian dishes. 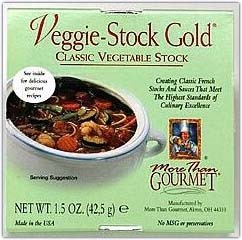 Made from a blend of select fresh vegetables, this classic Veggie-Stock Gold is a clear stock with no added starches or fat. Size: 1.5 oz. container makes approximately 4 cups of classic vegetable stock.